Horton Automatics of Ontario services and repairs ALL makes and models of automatics entrances. With several distribution centres and dealers servicing the province of Ontario, we have a location near you. 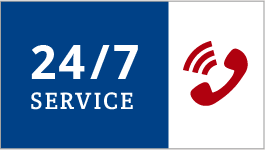 Horton Automatics of Ontario provides rapid service with our goal being 24 hour response time. Horton Automatics of Ontario recommends a biannual inspection. Horton Automatics of Ontario are AAADM certified, all technicians carry their AAADM cards with them. Once installed, your automatic door should be in good operating condition. You should have received an owner’s manual and this describes routine maintenance, cleaning and safety checks that you can and should perform. In addition to this you should consider a preventative maintenance program offered by Horton Automatics. This can take on a variety of forms from basic inspections for safety and operating effectiveness to full turn-key plans that include all labour and parts for a fixed fee. Call us at 1-800-866-9523. Our Service Advisors will ask you a few basic questions when you call in to ensure that dispatching a Technician is the correct course of action. Beyond this, we need to have any and all service work performed by a certified Technician on site. Call us at 1-800-866-9523. Our Service Advisors will ask you a few basic questions when you call in to ensure that dispatching a Technician is the correct course of action. Once our Technician is on site he will perform any necessary repairs. Based on the nature of the repairs, we will determine if this is a warranty issue or not. If there is deemed to be warranty coverage for the repair you will receive a $0.00 warranty invoice showing that work took place and what parts, if any, were used. If the repair is not covered under warranty you will be charge for relevant Labour and Materials. The Labour component will include both travel time and time on site. No. Our technicians can work on any brand of equipment. We have 15,000 square feet in Ontario stocked with a wide range of parts from all manufacturers. In the event that a required part is not in our inventory we also are supported by vendors that can readily access these parts. Can Horton provide a preventative service program? Are all of Horton’s Technician’s AAADM certified? Absolutely. We have 20 technicians in Ontario and all are certified. Unlike some of our competition who outsource their work, all of our Technicians are factory trained and direct employees.